Chanteuse Rock 'n' Roll US née le 18 Juillet 1947 à Ferriday (Louisiane). 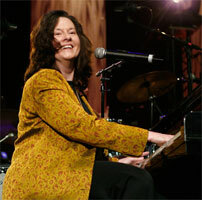 Linda Gail Lewis est la petite soeur de Jerry Lee Lewis. Linda Gail Lewis is part of a musical royal family -- her older brother is rock & roll icon Jerry Lee Lewis, and country star Mickey Gilley and gospel artist Jimmy Swaggart are her cousins. While it took Linda Gail a while to gain an audience of her own, she proved in time she was a gifted pianist and singer in her own right, well versed in rockabilly and first-era rock & roll, vintage country, boogie-woogie, and Southern gospel. Guided by her brother, Linda Gail launched a career as singer in the early '60s, cutting records with him and singing with his road band. It wasn't until 1988 that Linda Gail truly stepped out on her own and began wowing fans of vintage roots rock with her own piano prowess. After cutting a handful of albums for small labels, Linda Gail stepped into the spotlight with 2000's You Win Again, an album she recorded in collaboration with Van Morrison. Since then, Linda Gail has been an in-demand act in the U.K. and Europe and has released a steady stream of albums highlighting her rollicking piano and impassioned vocals. The youngest of four siblings, Linda Gail Lewis was born in Ferriday, Louisiana on July 18, 1947. Linda Gail was ten years old when her older brother Jerry Lee scored the first in a series of hit records with "Whole Lotta Shakin' Goin' On," and having soaked up many of the same country, boogie-woogie, and gospel influences as her brother, she dreamed of also having a career in music. Linda Gail loved to sing, citing Patsy Cline, Brenda Lee, and LaVern Baker as influences, and in 1960 she cut a single for Sun Records with her sister Frankie Jean Lewis that went unreleased. 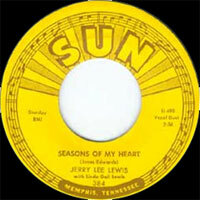 Linda Gail's next attempt to record with one of her siblings went better; after a few years of singing backup with Jerry Lee's road band, they recorded a 45 for Sun, "Teenage Letter" b/w "Seasons of My Heart," that was released in 1963. By the time the disc came out, Linda Gail was already on her second marriage, and she was eager to move forward in her career. She cut a solo single for ABC-Paramount Records, "Break Up the Party," in 1965, and another for Columbia, "Who Will Be the Next One," in 1966, but both proved to be one-offs. Linda Gail did gain valuable experience when she joined a package tour featuring acts from the rock music TV series Shindig, and continued to tour with her brother. In 1968, after years away from the charts, Jerry Lee Lewis scored a major country hit with "Another Place, Another Time," and with his career back in high gear, he set out to give his sister a hand. At Jerry Lee's behest, his label, Smash Records, issued Linda Gail's first solo album, 1969's The Two Sides of Linda Gail Lewis, and later the same year, she and Jerry Lee teamed up for a duet album, Together. 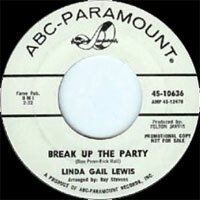 Linda Gail and Jerry Lee's duet on "Don't Let Me Cross Over" was a minor hit in 1969, but while Smash and its affiliated Mercury label released singles by Linda Gail up to 1974, her recordings enjoyed little chart action. Linda Gail was still touring with Jerry Lee's band, opening his shows and singing backup, but she developed problems with drugs and alcohol, leading to a hospital stay in 1976 following a nervous breakdown. Eager to lead a quieter life, Linda Gail dropped out of music in 1977, settled down with her sixth husband, and devoted herself to her family. In 1986, Linda Gail Lewis returned to the public eye, rejoining her brother's touring party, but when Jerry Lee's then-wife Kerrie Lynn McCarver objected to her opening the shows (Kerrie Lynn had performing aspirations of her own), Linda Gail dropped out of the show. In the '70s, Linda Gail had begun playing the piano, adopting a style that reflected the sound and influences that also informed her brother's music. Now that she was no longer touring with Jerry Lee, Linda Gail decided to strike out on her own, and she hit the road with her own piano-pumping band playing a potent fusion of rockabilly, boogie, and vintage country. She became an especially popular attraction in the U.K. and Europe, and in 1990 she struck a deal with the French New Rose label to release her first album in 21 years, International Affair, cut in Memphis with a band of Bluff City musicians. Arriving in 1991, Rockin' with Linda was cut during a visit to the U.K., with Linda Gail playing a set of rock & roll favorites with her British touring band. The year 1992 saw the release of I'll Take Memphis, a set cut in tandem with Norwegian rocker Stephen Ackles. Ackles was also part of the band for Love Makes the Difference, an album Linda Gail cut in Oslo in 1992 that went unreleased until 1995. While Linda Gail continued to tour regularly, she took a break from recording until she was playing a gig in Wales and discovered one of the fans who came out to see her was Van Morrison. Morrison invited Linda Gail to a recording session a few days later, and they quickly cut 2000's You Win Again, an album featuring Morrison's interpretations of a number of vintage rock and R&B tunes (some made famous by Jerry Lee Lewis) in which she received co-star billing. 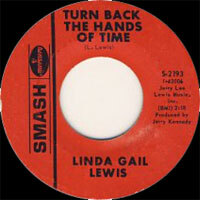 The album helped to raise Linda Gail's public profile as more than just Jerry Lee's sister, and she continued to play for fans in the United States, the U.K., Europe, and the Netherlands on a regular basis, while cutting occasional albums for overseas labels, including 2004's Boogie Woogie Country Gal, 2006's Hungry Hill, and 2012's Gas Station Flowers. In 2016, Linda Gail recorded Hard Rockin' Woman! 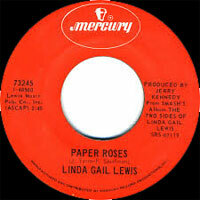 for the rockabilly specialist label Lanark Records; the set included appearances from guitarist Danny Harvey and Linda Gail's daughter, Annie Marie Lewis. Linda Gail teamed up with songwriter and vocalist Robbie Fulks for a 2018 duo album, Wild! Wild! Wild!, a high-spirited set that included several numbers written to order by Fulkss for Lewis. 03/1965 SP ABC-PARAMOUNT 45-10636 (US) . 09/1968 SP SMASH S-2193 (US) . 03/1969 SP SMASH S-2211 (US) . 08/1969 SP SMASH S-2240 (US) . 03/1970 SP SMASH S-2261 (US) . 08/1970 SP MERCURY 73113 (US) . 09/1971 SP MERCURY 73245 (US) . 07/1972 SP MERCURY 73316 (US) . 11/1972 SP MERCURY 73343 (US) . 03/1974 SP MERCURY 73363 (US) . 1987 SP Rose 175 (F) . Oh Boy / ? 1995 SP Bellmark 74513-2 (US) . 2000 SP VIRGIN 38754 (US) . 2002 CD Lantasi LS 10001 (SW) .